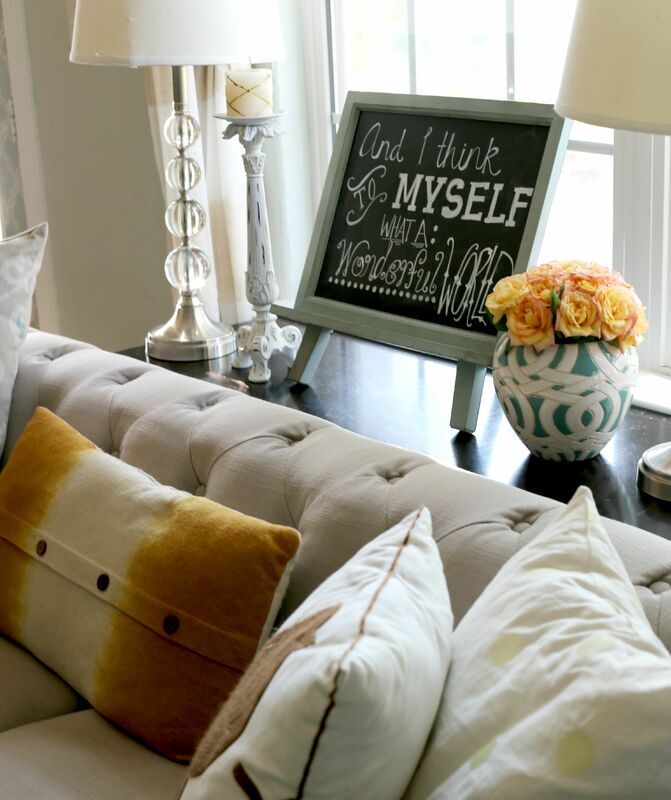 For as long as I can remember (well, at least as long I’ve been interested in decorating and design), I’ve had this thing for tufted furniture. 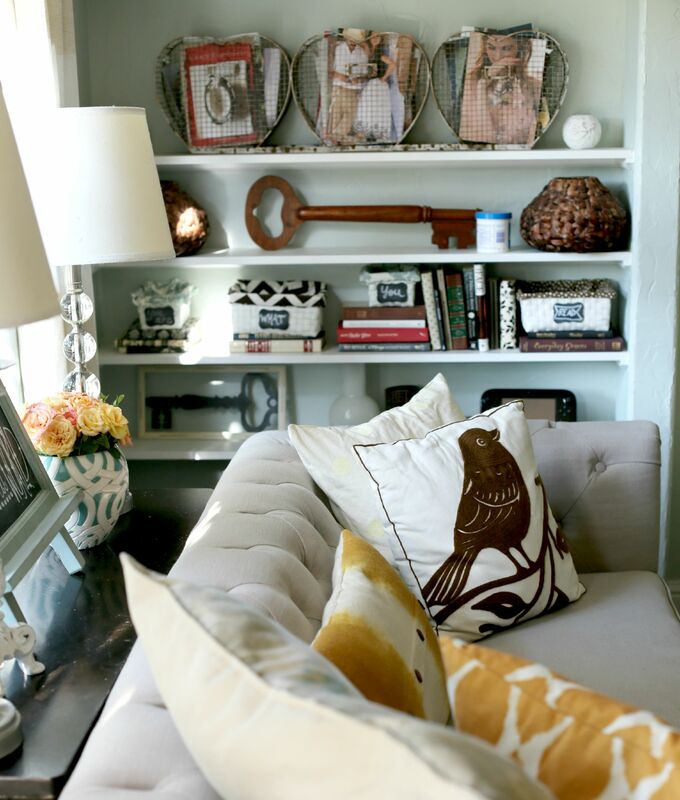 We’re not going to call it an obsession or anything cray-cray like that, but I was always inexorably drawn to every tufted wingback at Goodwill, no matter how battered. 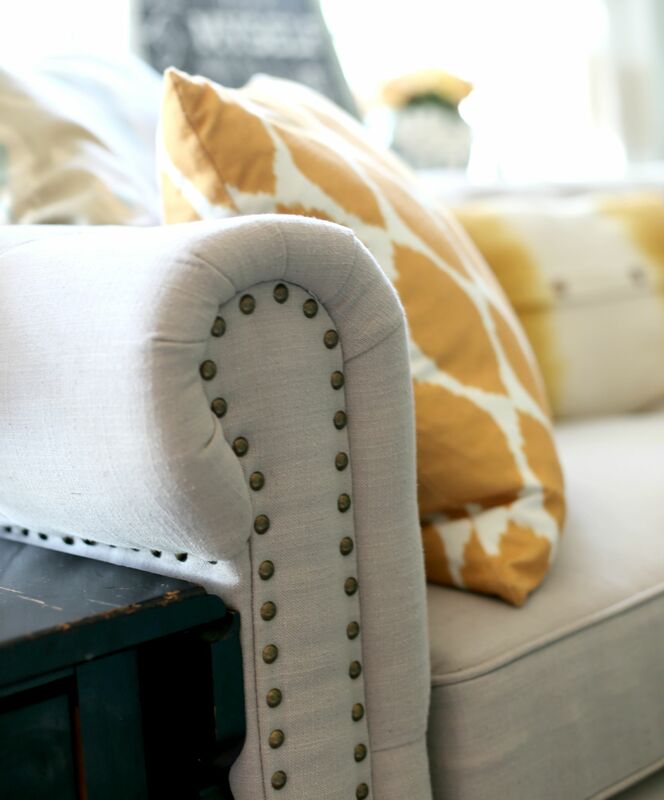 My knees get a little jelly-ish at the sight of a worn-in tufted leather sofa, and my DIY Tufted Ottoman is still the most pinned item I’ve ever made. So, you can just imagine how my heart went pitter-patter when I did a rather lazy craigslist search for “Tufted Chesterfield sofa” one day–expectations extremely low–and an entry popped up that looked–if not promising–possible. It was a dark, grainy, ugly-McAwful picture of TWO linen tufted Chesterfield sofas in a drab furniture store showroom. But despite the picture’s ick factor, I could see the potential. Especially when I looked them up and discovered they were the well-reviewed Gordon Tufted Sofa, 32″HX91X38″D, NATURAL LINEN that Amazon carries for $1,200. The furniture dealer was only asking a little over 1/3 of that price, and the listing was 2 weeks old, so I was sure it was already sold, but when I called, it was still available. HUZZAH for terrible, dark, grainy, ugly-McAwful pictures that had most assuredly scared off all of the other potential buyers! We emailed back and forth and exchanged a few phone calls, and that Saturday evening, after we had attended a birthday party for Shaun’s family, halfway to Dallas, we ended up driving the rest of the way up there to see the couches in person. The showroom wasn’t much better in person than it was in the pics. It was in a strip of “furniture outlets,” and I couldn’t quite tell what I thought of the couches at first because their surroundings were–ahem–not quite my style. When I’d first called, I had discovered that not only did he have the two full-sized couches, but he also had one matching love seat. Sadly, when we got there, we discovered that the love seat had two little slits in the right arm from careless box-opening techniques. Not that that was going to stop me. And so the haggling began. In the end, we got both the couches and the love seat WITH TAX AND DELIVERY (two hours away, mind you) for less than the cost of ONE of the sofas on Amazon. I was ecstatic. I hadn’t been planning on replacing our couches, which were comfortable and hid stains like a toddler hides the remote. My tufted linen Chesterfield sofa dreams had been just that–distant maaaaaaaaybes if I happened upon a good deal at an opportune time…one day…possibly. And then, within two whirlwind days, I had sold my old sofas (y’all, proper styling is everything. I used pretty pictures from my blog, and people on a local FB site were clamoring over those perfectly fine but certainly not super-exciting gray herringbone couches like I was selling some sort of prized heirloom for 95% off), and my dream couches were in my living room. And I do mean dream couches, people. Because, not only did they look about a trillion times better once they exited that cluttered “showroom,” but they’re a) comfortable b) well-made and c) a HUGE bargain…which means that, even if (when) they don’t stay pristine, I won’t feel sick to my stomach for dropping $2,700 on one little ol’ couch. (Because, yes, that’s what the fancy versions of this couch cost, and no, I was never going to go there). Have I scotch-guarded the daylights out of them? Yes. Do I keep a blanket draped over the one that sits in the main thoroughfare between our kitchen and living room, much to my husband’s eye-rolling amusement? Mmm Hmmm. Have I already had to wipe up a few marks and greasy spots? Yup. (They came right up, in case you’re wondering, thanks to this magical cleaning solution). But you know what? 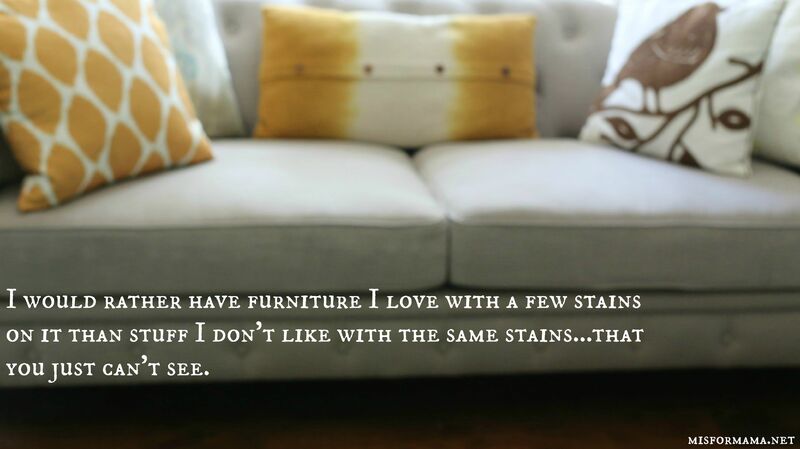 As I told a reader who was wondering how in the world I would cope with light-colored furniture and so many kids, I would rather have furniture I love with a few stains than stuff that I really don’t like with the very same stains…that you just can’t see. As long as said loved furniture doesn’t cost very much, of course. (I’ve already paid for my couches by clearing a few more items that I didn’t need out of my house. Feels SO good). Oh man, does finding exactly what I’ve been looking for for at a tiny fraction of the price make me giddy! This should increase your giddiness – I live by an Anthropologie/Urban Outfitters outlet (their factory used to be right up the road). I stopped by yesterday for a quick browse and saw a very familiar looking couch – I realized it’s yours! Retail at the outlet was $1000 and the matching chairs were $500. No delivery offered either. So you really scored an amazing deal! Well you lucky girl!! I’m happy for you. I, too, love Chesterfield sofas, but am still waiting for my ship to come in. Maybe a casual Craigslist search is in my future. “-) They look beautiful and of course fit perfectly with your style– which I admire. I’d call those sofas gifts from heaven, yes? God knows how to surprise us. Nice score! They look amazing. I just hope that one day I will find some that I love. Does Shaun care when you buy/sell/swap out the furniture? Yea yea yea!! They’re lovely!! 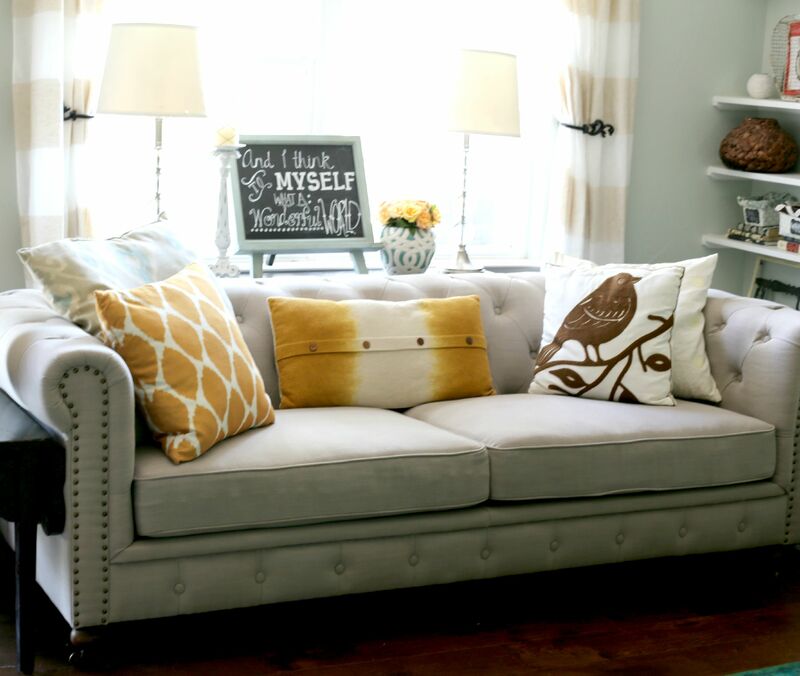 Love the couch and the pillows you threw on them. BTW-think it’s the blue/white container on the shelf?! So unless I missed it, you never said how you handled the box cutter slashes. What did you do? Picture-worthy?